Hi, guys! Hope you all had a great weekend! Do you guys struggle to wear your handmades? How easy or important is it for you to make things that work for your Monday-to-Friday life? Personally, I’ve found recently that the clothes that are appropriate for my verrrrry casual (and messy!) jobs make me feel a bit like a slob. I feel happy and confident in my fun blazers or knitted sweaters, but there’s just no point wearing them to strip furniture or glue foam! But I’ve been finding lately that my buttondowns and raglan pullovers get lots of wear in the workshop. In fact, my hood-less Undercover Hoods get worn so much, especially the striped one, that I sometimes get worried that my boss thinks I only own like two or three garments! So adding a easy-wearing tops to my wardrobe felt like a good idea. 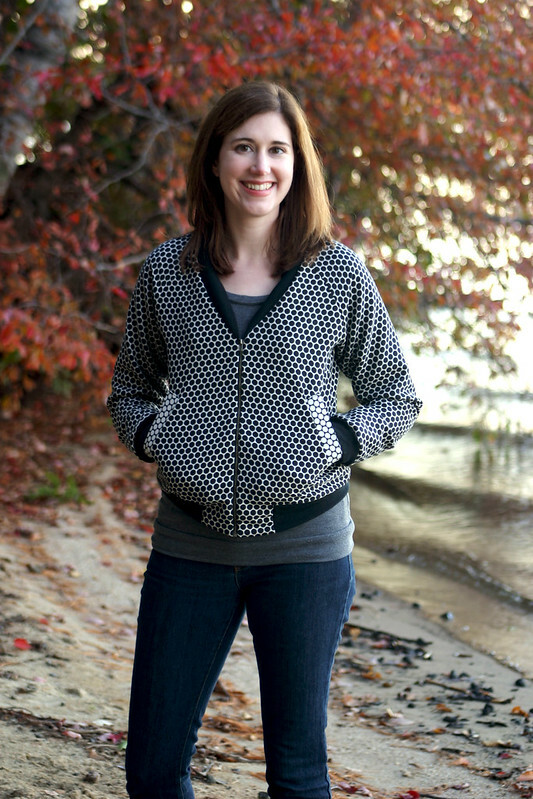 So, when I saw the newest Papercut Patterns collection, I immediately ordered the Bowline Sweater. It seemed like just the thing to punch up my casual wardrobe, and I also just really wanted to know how it was constructed! Not gonna lie- when I opened up the pattern and saw what the front pattern piece looked like, my mind was kinda blown. I wasn’t really sure how it would come together, but I just trusted the instructions and crossed my fingers that it would come out alright in the end! It was super fun to make because of this… it felt a bit like an experiment! I’d been wanting to make a garment with this fabric from my shop for a while. I was catching up on my blogroll last weekend when I saw Rachel’s version of the pattern, then Fiona’s, and I immediately started working on my own! I’m so glad I did because I really love this pattern and fabric combo. 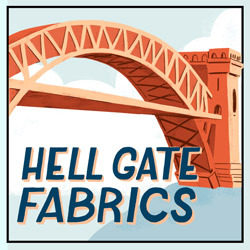 The fabric is a lightweight French terry, 66% rayon/27% cotton/7% nylon. The rayon content makes it super drapey, as you can see, which is really nice for this design. I wouldn’t recommend using something terribly thick or heavy for this as you have quite a few layers going on when you sew up the pleat/dart combo and it could get lumpy. I’m really happy with the final product! I loooove this color and have been looking forward to wearing this fabric, and I also really like that this looks a bit nicer than a plain sweatshirt. 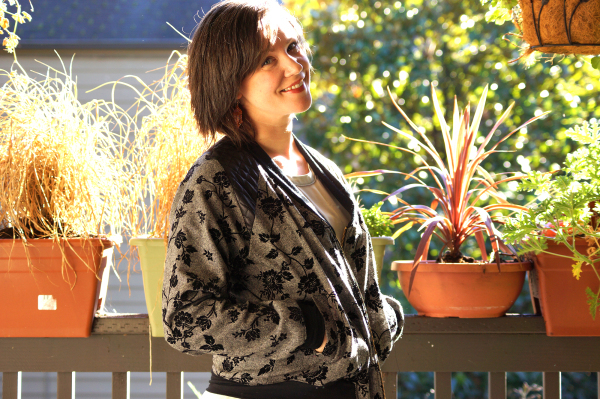 It’s an easy way to dress up a bit more without sacrificing comfort, mobility, or time getting ready in the morning! I’d like to try a striped version one day, too, because the striped sample on the Papercut website just looks so cool! 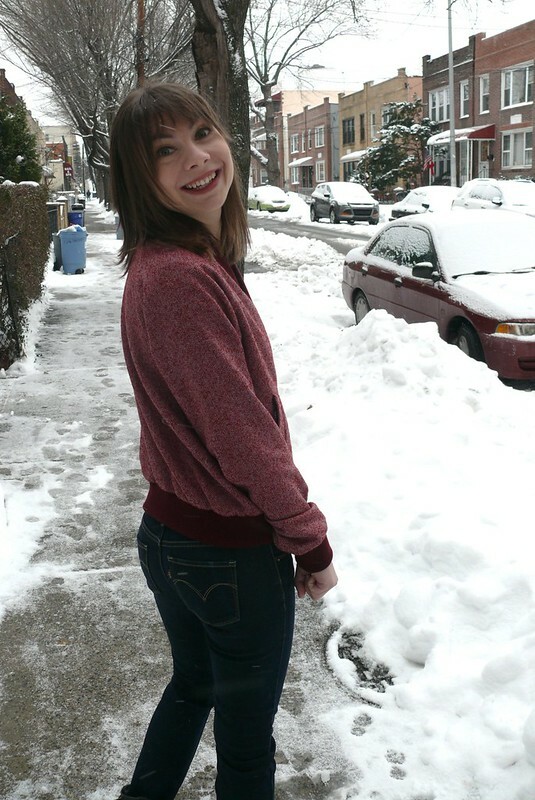 And maybe then I won’t have to wear my striped sweatshirt every third day, heeheehee! 🙂 Now, what are you guys sewing right now?? Hellooooooooo! How are you guys doing? Everybody having a good day? I hope so! So, do you ever notice themes in your sewing? Lately my sewing has been all about fun fabric in a simple shape. Fussy sewing and fussy garments just aren’t very cool in the heat! 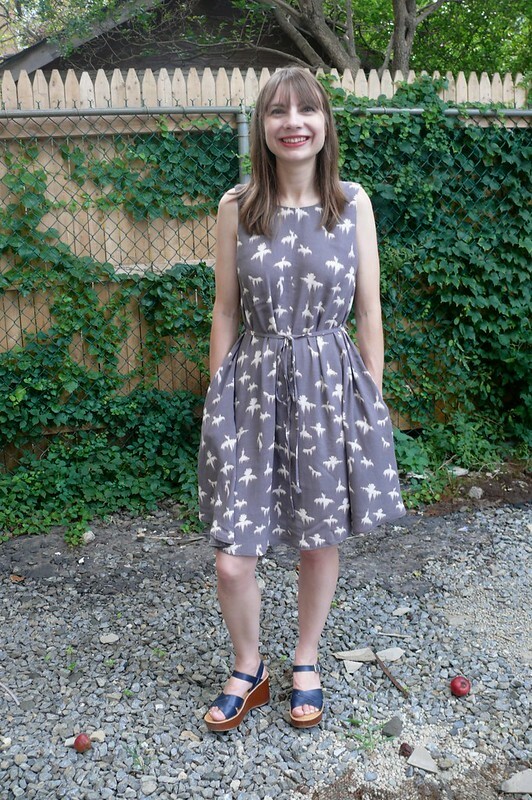 So, for August’s Mood Sewing Network project*, I decided to stay the course and make one more fun print + simple silhouette dress. Why not keep the streak going? 🙂 I chose this beautiful rayon print because I loved the abstract images… I mean, are these birds, or are they palm trees? My vote is for palm trees, but that might just be because I love them! 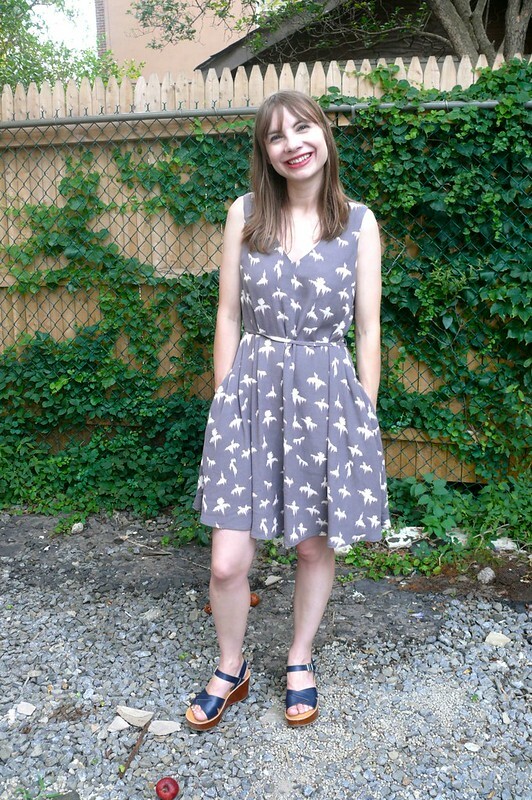 The pattern is the Papercut Patterns Sway dress, the long variation with a tie belt. Katie sent me a copy to try along with the Guise Pants. Thanks, Katie! Now, I was really drawn towards the shorter, trapeze-ier version, but I figured I’d give this longer length a try just for kicks. It feels a little frumpy compared to the shorter dresses I’ve been wearing lately, but I may just need to wear this a few times to get comfortable with the length and the belted waist. The pattern is very easy to put together and the instructions are nice and clear. 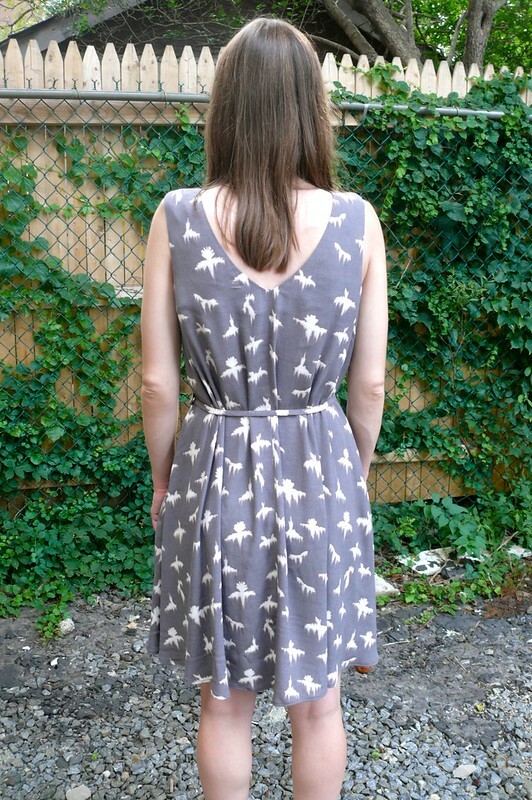 I generally avoid anything with bias seams as I hate leveling out the hem, but it was really pretty painless. I’ll definitely revisit this pattern! 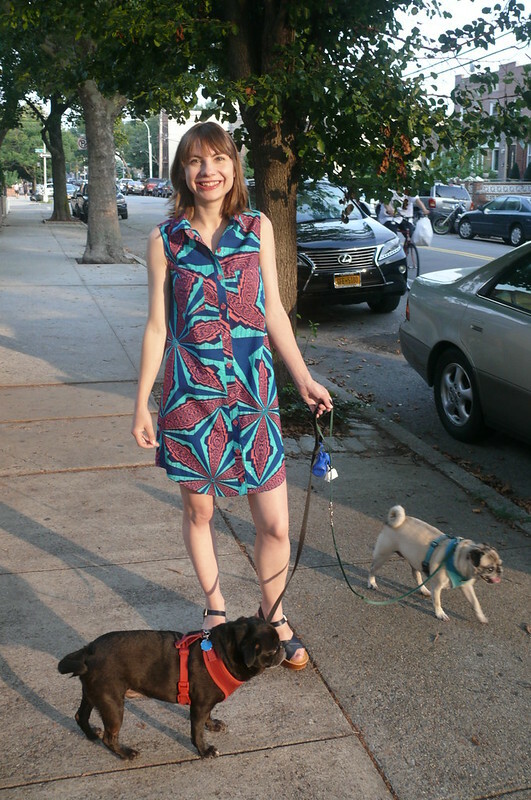 The dress has center front and center back seams, and I was concentrating so hard on fitting all the pattern pieces on the fabric with the print all going the same direction that I didn’t even consider matching the print. Whoops! Hopefully it’s not too noticeable. 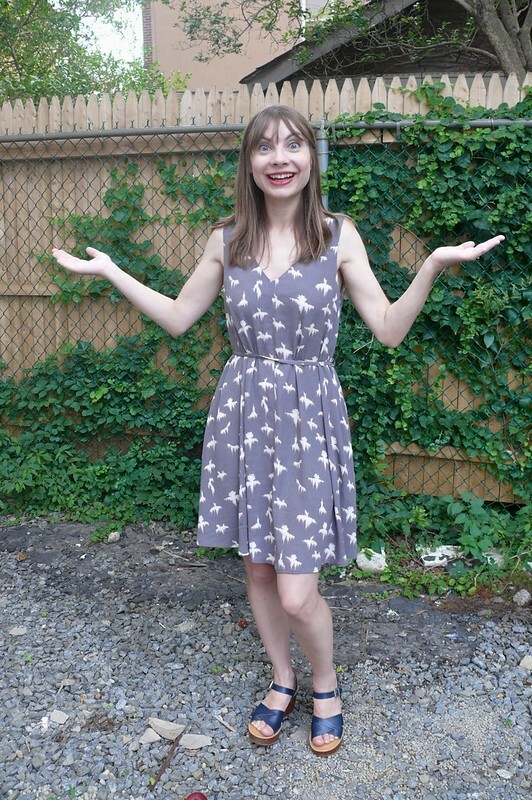 Why, it’s a reversible dress! Since it only needs to fit at the shoulders, it can be switched around and worn with either the v-neck or the round neckline facing the front! Tricky business! Man Friend review: “The belt is nice”. 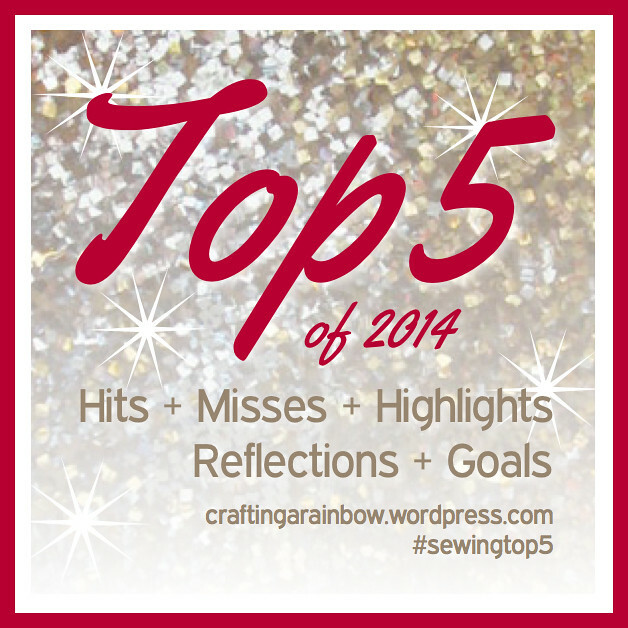 Alright, now please tell me- what’s on your sewing table right now? Simple silhouettes with fun prints? All solids all of the time? 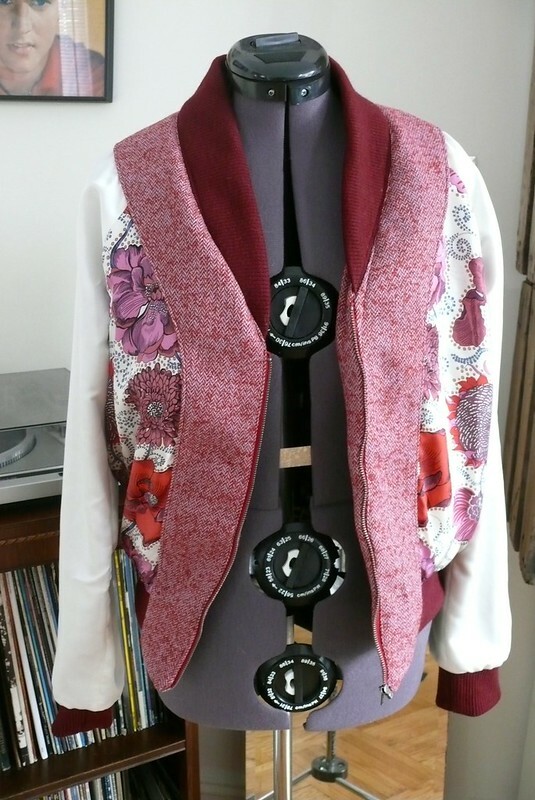 Complicated tailoring projects? And, are you Team Palm Trees, or Team Birds? Do tell! Hi, guys! Hope you’re all well and enjoyed a lovely weekend! I had a great weekend enjoying the beautiful May weather and hanging out with my visiting in-laws. I even managed to sneak in some sewing and a trip to see Mad Max: Fury Road! How about you guys? Question: do you fear trousers? Even though I love wearing them, I’ve been a little nervous at the thought of sewing them. Welt pockets, a front fly, fit… there’s just so much to think about! But after sewing up two pairs of trousers for my second semester of ladies’ tailoring this spring, I was stoked to take on a pair for myself! So I was excited when I saw the Guise Pants in the new Papercut Patterns collection- I was really hoping to find a pattern for pleated trousers! Katie kindly sent me a review copy for free… thank you so much! The pattern features front pleats and a fly closure, with side pockets and back welt pockets. 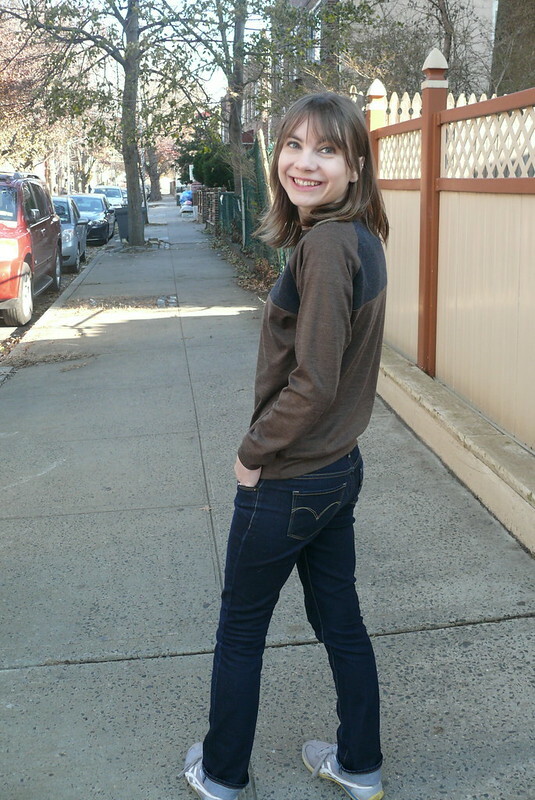 A unique feature of the pants is the elasticated back waist- I’m not usually very excited about elastic waists as they can look a little too casual, but my waistline fluctuates constantly by a few inches, so it’s nice to have some flexibility there. Plus, I never tuck in my shirts, so you’ll never even see the elastic in the back! My plan was to make these in a nice soft wool, a pretty mint green, if I could find one, and if I couldn’t, in grey. But somewhere along the way I had the idea to cut into this strange synthetic jacquard from my stash. I bought 3 yards from Chic Fabric ages ago for something like $7/yd, planning to make an Elisalex for a winter wedding, but I didn’t have time and it’s sat in my stash ever since. It’s a pale gold that’s really metallic (hard to tell from the photos), and the wrong side is actually mauve. It smells a little funny when you press it, frays like crazy, and is super scratchy. So maybe not the best choice! But it was really fun to use! The thread, button, and zipper were in my stash, too, and I had *just* enough elastic to make it, so these are a total stash bust! Yay! 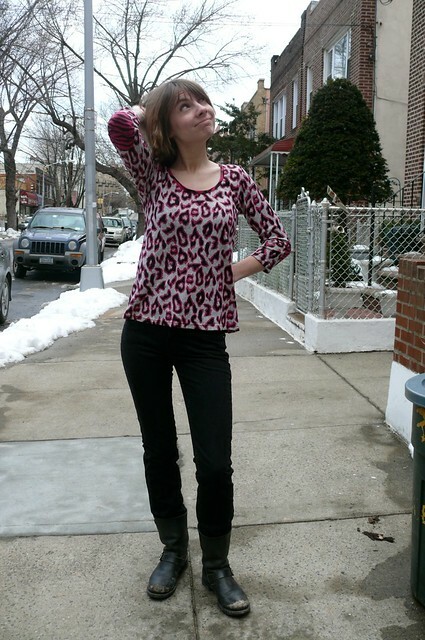 Here’s a shot so you can see where the rise sits on me (a few inches below my natural waist). OK, let’s talk construction. These are a very straightforward sew and nothing was too confusing or difficult. I followed the instructions for the welt pockets and fly and everything went smoothly. One thing I noticed is that Katie refers to “left” and “right” as you’re looking at the garment rather than as you wear it, the way some pattern companies do. It’s clear from the diagrams which side is which, though. There’s a typo on step 7- it should say 3/8″, not 3/4″. And one little thing I did differently from the instructions was to finish the curved edge of the fly facing before doing anything. It’s just easier for me that way. I also finished the hems with seam binding to help control the fraying. As you can see, this fabric is pretty stiff, and these pants would probably look much better in something with more drape. I had to omit the button loops from the back pockets- they were just too bulky in this fabric. 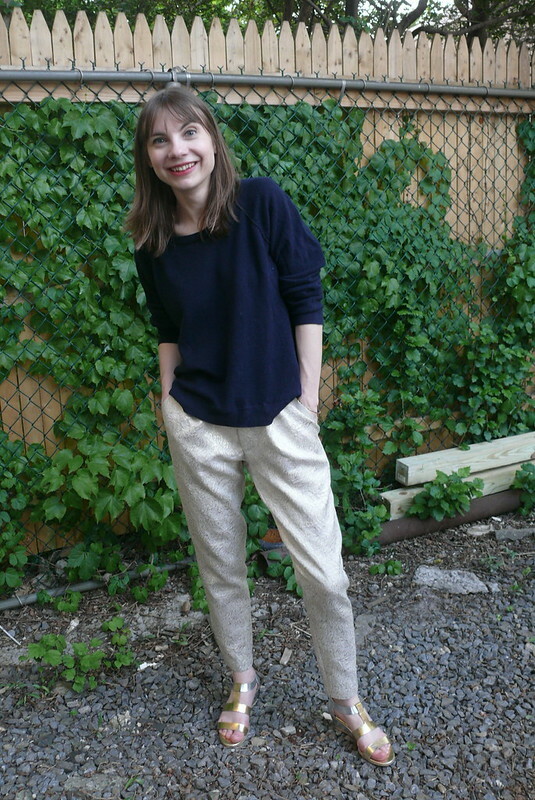 It’s kinda funny… in my tailoring class, I realized that I had most success with welt pockets when I chose fabrics that don’t fray easily, but for these trousers, I picked a jacquard that seemed to disintegrate in front of my eyes! Oops! Next time I make this pattern, I’ll add 3/8″ to the lower edge of the waistband facing- Katie has you neaten the waistband edge and topstitch it down from the right side, but I prefer the seam allowance to be folded under. And I will add a bit more room through the ankle- I have been noticing lately that I just don’t have enough room there in almost every pair of RTW pants I own. I could stand to take these in at the side seam a bit, but I was afraid to fit these too snugly since the fabric is so ravelly! I thought I might blow my seams out if the trousers were too fitted!!! Alright, fess up- are you afraid to sew trousers? If not, do you have a favorite pants pattern? Any you would recommend to me? 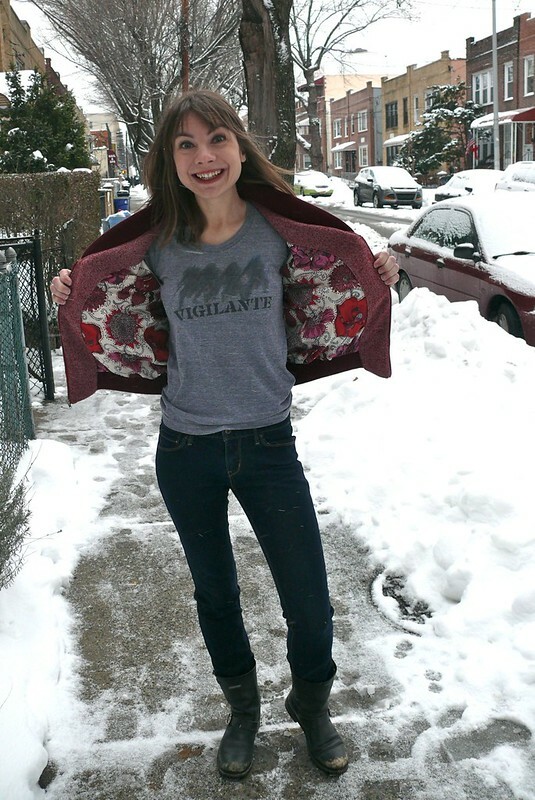 Rigel Bomber January: Your Bombers!!! Hi, guys!!!!! I’m sorry to bring you sad news, but Rigel Bomber January is over! It’s OK to cry… just let out all the bad feelings. 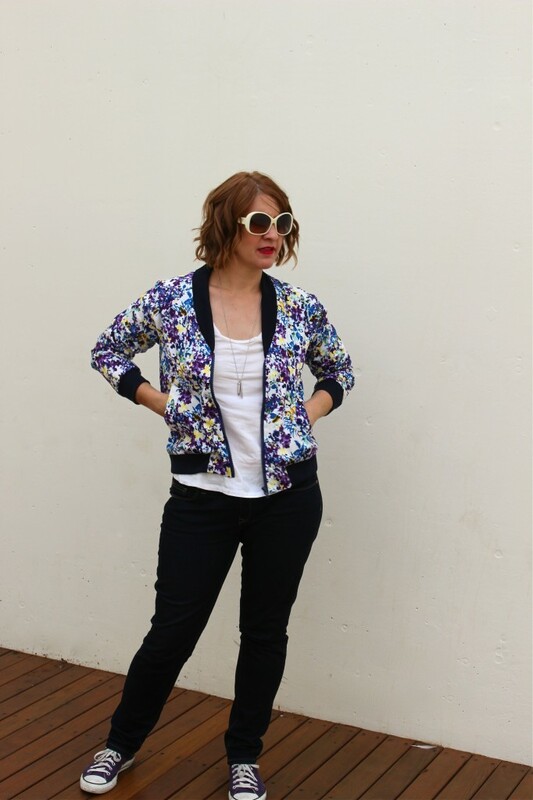 The good news is that I think a roundup of some of the amazing bomber jackets you guys sewed will lift your spirits! What say you? 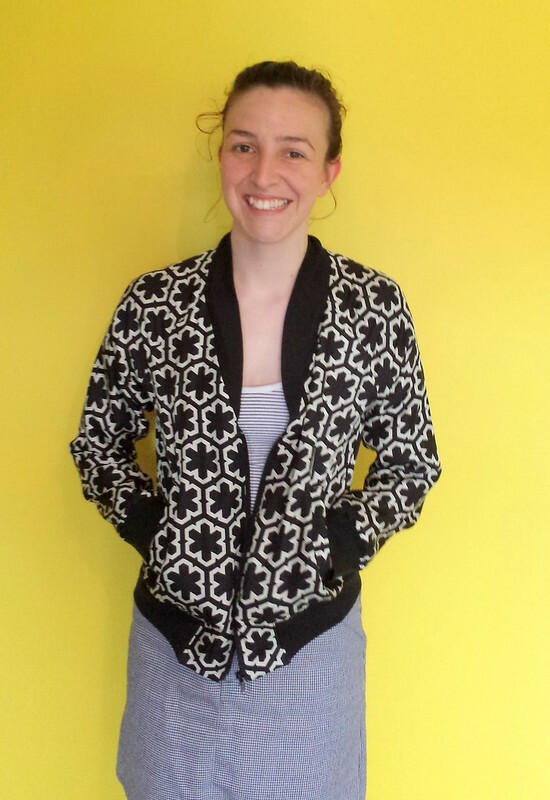 Stay tuned until the end… I’ll reveal my favorite bomber, the winner of a Papercut Pattern of her choice! 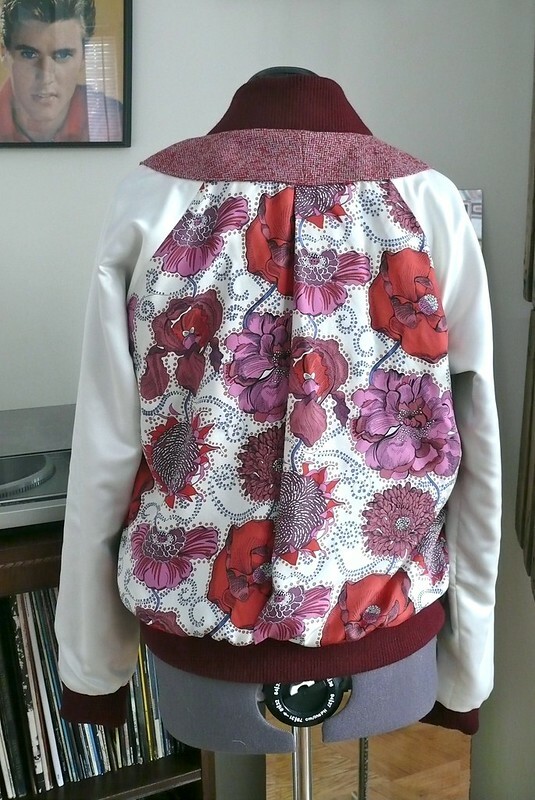 OK, so I’m only featuring 1/3 of the finished jackets here… to see the rest, check out Kat‘s post and Mel’s post! Also, there are lots more cool bombers on Instagram… just search for the tag #rigelbomberjanuary and you’ll see them (I just couldn’t find a way to pull photos from IG that wasn’t super time-intensive… sorry!)! Here’s Carlalissa’s (with a bonus doggie photobomb)! Now, I want to show you Kat‘s version! She’s managed to fit snails, pea pods, AND leopard print in hers! Oh, She Dabbles! I really like the mix of fabrics she chose! Super cool! Girl, I’ll be in touch to hook you up with your free pattern! Alright, that about wraps it up! Thanks so much for playing along! January was much more fun and bright this year! Now, tell me, which is your favorite jacket? And what’s on your sewing machine right now? 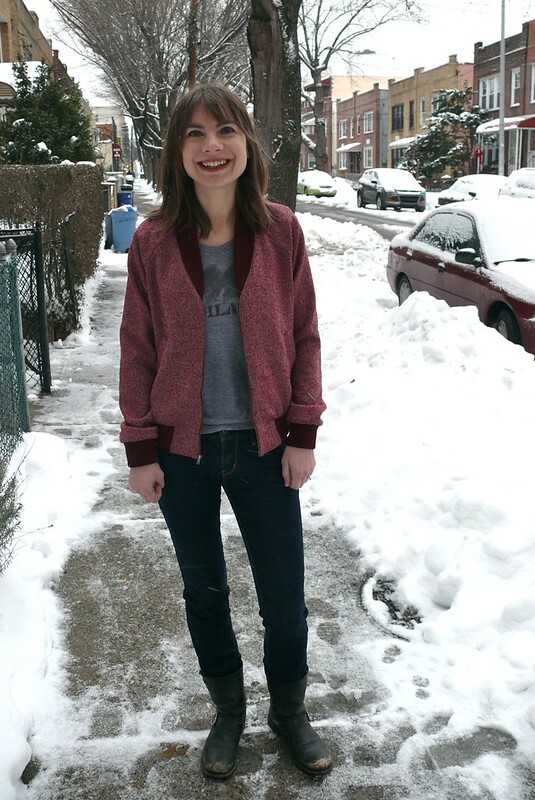 Oh, and don’t forget to check out Kat and Mel‘s blogs to see the rest of the bombers! 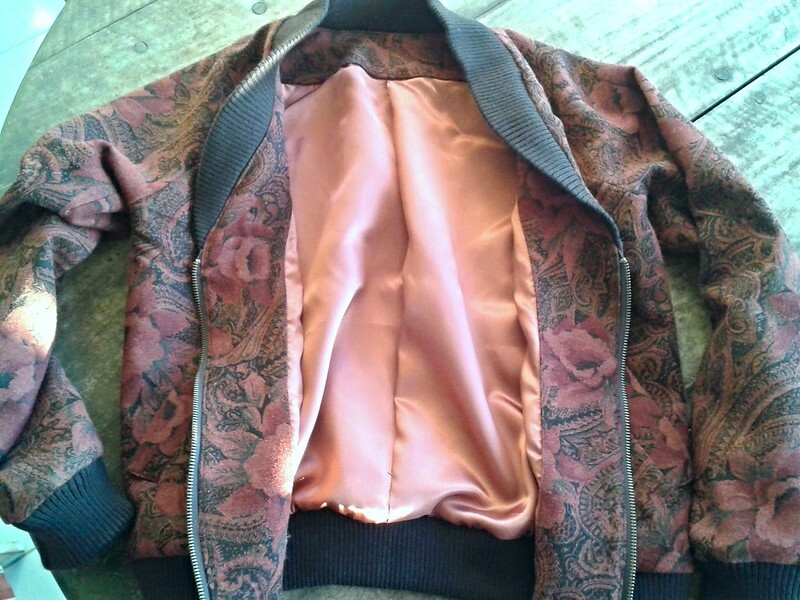 Ginger Made: Rigel Bomber Jacket! Woohoo! My bomber jacket is done! I’ve had so much fun making this alongside everyone taking part in Rigel Bomber January! 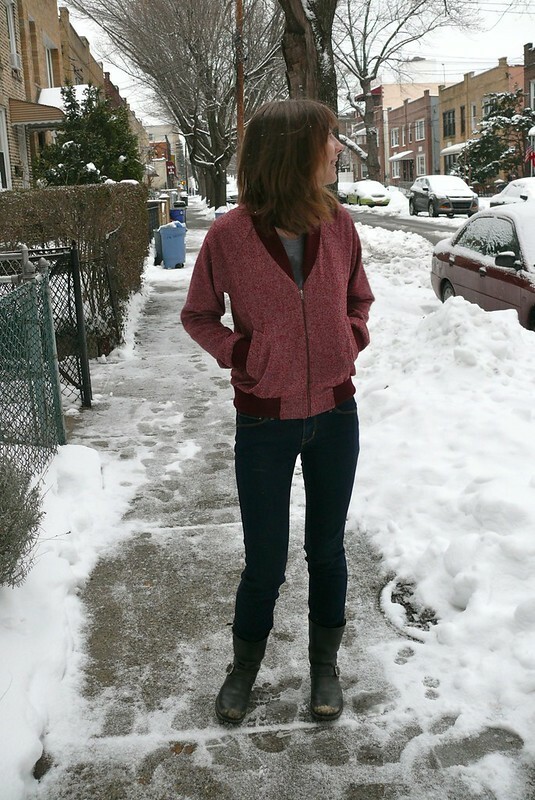 In case you haven’t been following these posts, Kat, Mel, and I are making the Papercut Patterns Rigel Bomber Jacket during the month of January with anyone else who wanted to join in on the fun! It’s a little “sew-together”! I’ve had this pattern since it came out, so it was nice to have some companions (and a deadline!) to give me the nudge I needed to finally make it! So, here it is! I’d originally planned to look for something black with gold sparkles or glitter, but this wool herringbone caught my eye at Mood and I had to have it! It was the end of the bolt and there was just enough for the jacket… must have been fate! 🙂 I matched it to this burgundy ribbing, also from Mood. They’ve recently started to carry this ribbing in quite a few colors, in pre-cut pieces that are 38″ x 7″ ($9.95 ea). I just barely squeezed all the pattern pieces onto two pieces of ribbing. This is a heavier ribbing, like you would see in a sporty jacket, not a sweatshirt or tee, in case you’re curious. These colors are totally different than ones I usually wear, but they’re really pretty and have a sort of autumnal, collegiate feel. The zipper is a metal YKK from SIL Thread, my favorite place to shop for zippers. It’s $5 for a 22″ separating zipper, and they shorten them to custom lengths for an additional $1, not bad! I think my zipper may have been shortened a tiny bit too much- we had some confusion over converting the listed metric length to imperial measurements- so it doesn’t come up quite as far as I would like it to, but, whatevs. It happens! Since my fashion fabric is pretty lightweight, like suiting, I interfaced the center fronts before installing the zipper to prevent any waviness. 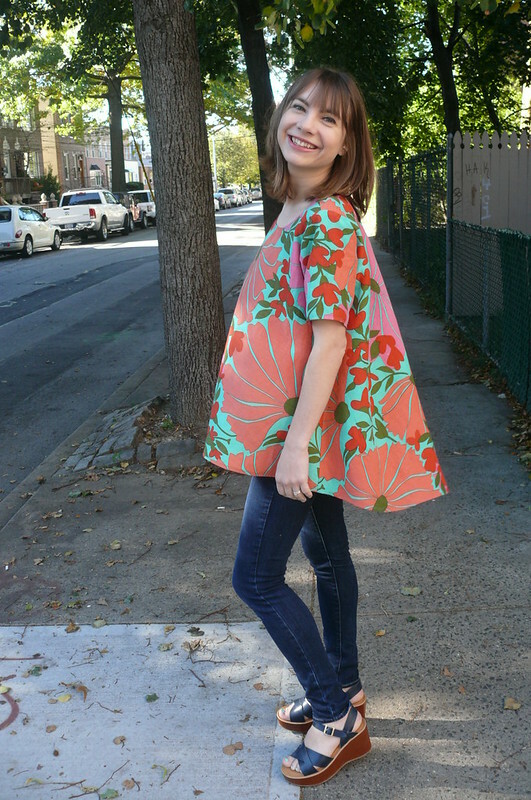 This pattern is actually really quick and easy to sew! The welt pockets take some time to mark and sew, but that’s the hardest part and it’s over at the very beginning, so the rest of the project is a snap after that! 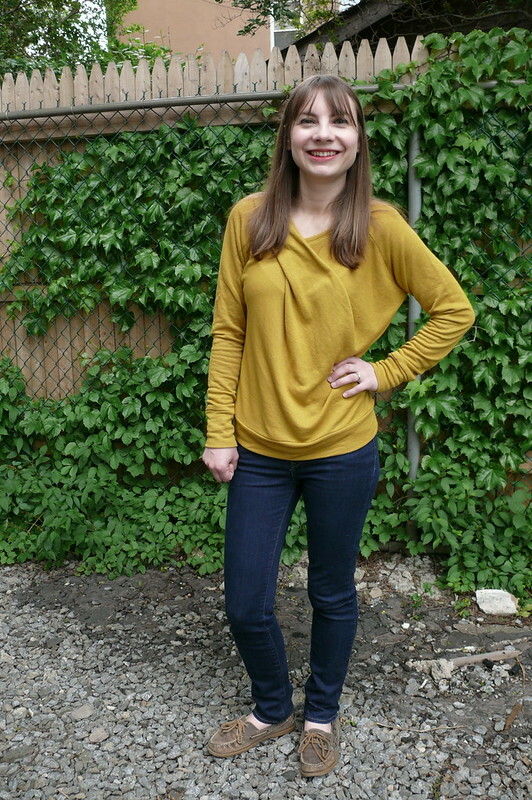 Raglan sleeves are just so quick and easy… I definitely prefer sewing them over set-in sleeves! Speaking of sleeves, I lengthened them by 2″- I probably didn’t need to add so much length, but I like my sleeves on the long side. That’s the only alteration I made- it’s otherwise a straight XS. OK, let’s talk about the lining! I agonized over whether or not I should use this lining or not for a very long time. You see, the floral print is Liberty silk twill (! ), a gift from the lovely and oh-so-sweet Dibs. She sent me a meter a few years ago and I’ve been too scared to cut into it because it’s just so nice! I really hesitated before using it because I wanted to make something special, but the print goes so nicely with the herringbone and I knew that I would be happy looking at it every time I wore this jacket, so I decided to go for it. Thank you, Dibs! I didn’t have quite enough for the entire lining, so I cut the sleeves from some poly charmeuse I had leftover from my final patternmaking project (my classmate worked in the cutting room for Vera Wang and brought yardage for everyone in the class to use… so kind!). I really like the way the two fabrics work together, and I’m happy I was able to use some fun stuff from the stash. 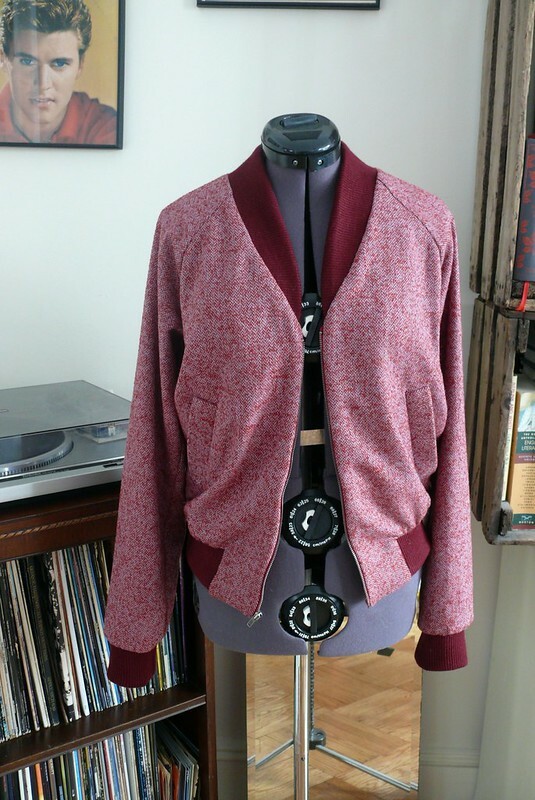 🙂 As I was putting the finishing touches on the jacket, I realized that it would be really easy to make one that’s reversible! I’ll have to try that sometime… wouldn’t that be fun? I wonder if anyone else has tried that! Alright, I think that’s all! Any other construction techniques or tips I used are detailed in the RBJ posts I’ve put up this month, so if you want more info on how I lined it or anything like that you can look there! Keep posting your finished bombers in the Flickr group or on Instagram, using the hashtag #rigelbomberjanuary. 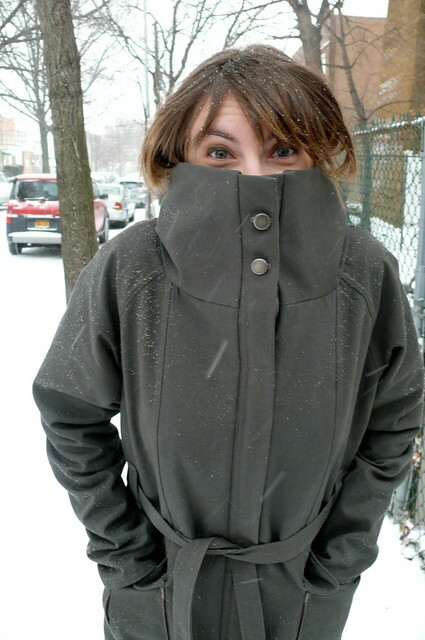 Reminder: Kat, Mel, and I will each pick a favorite jacket and the three makers will each get a free pattern courtesy of Katie from Papercut! Yay! Thanks so much for sewing alongside me! It’s been so much fun!!! 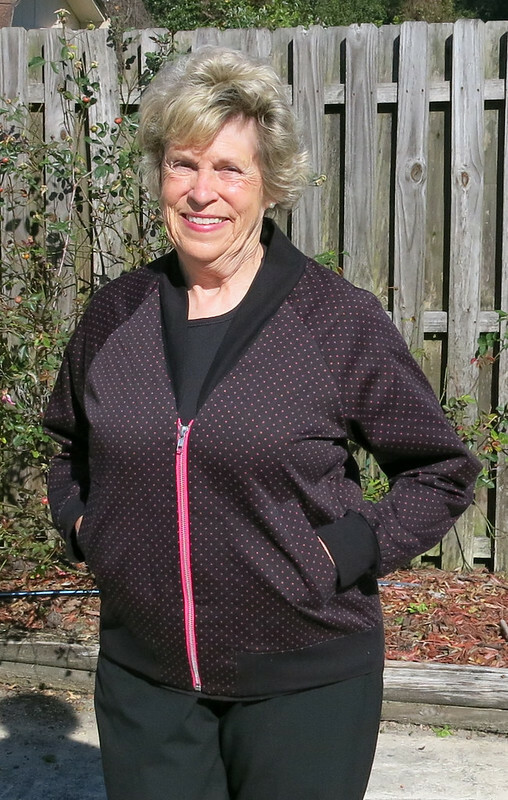 Check out Novita‘s- she made a removable fleece lining for extra warmth! It buttons in… clever! Florals not your style? How about tiny pineapples?! 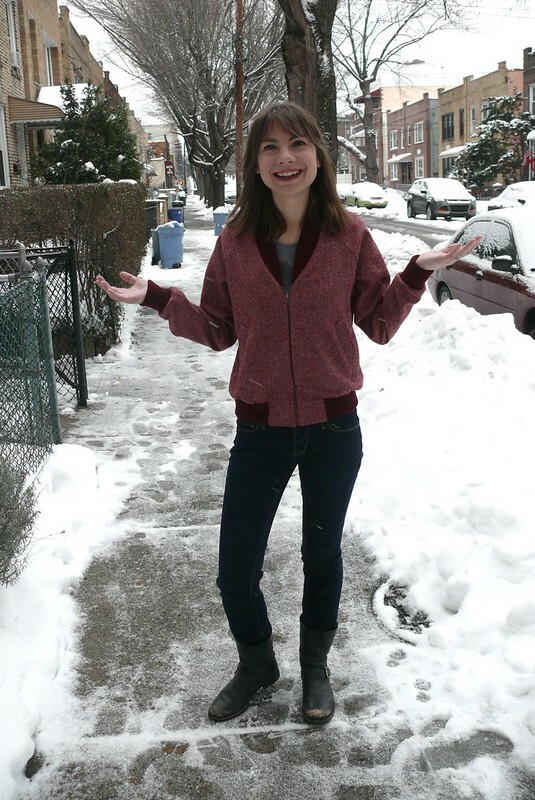 Look at this fun jacket, made by Elizabeth! Or polka dots? Check out Lucinda‘s! 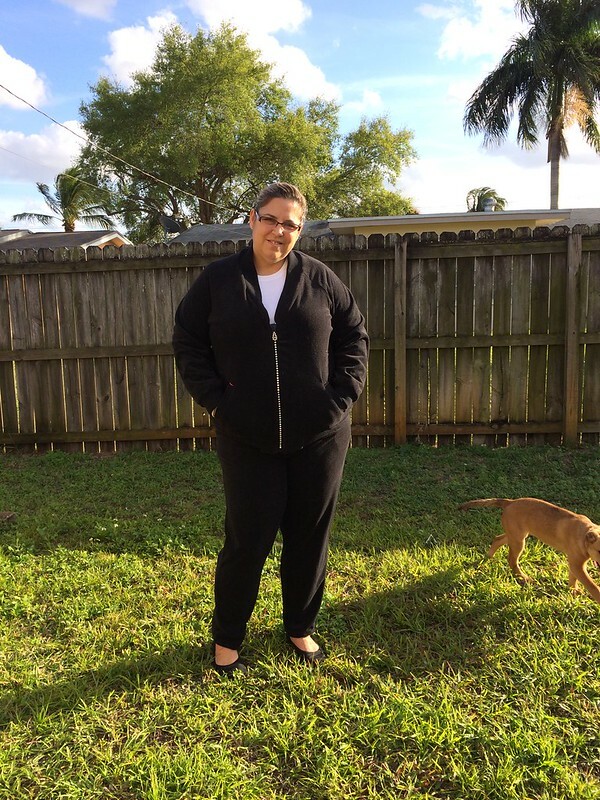 What about a cozy version in sweatshirt fleece, like Sophie-Lee‘s? I’ll take one, please! 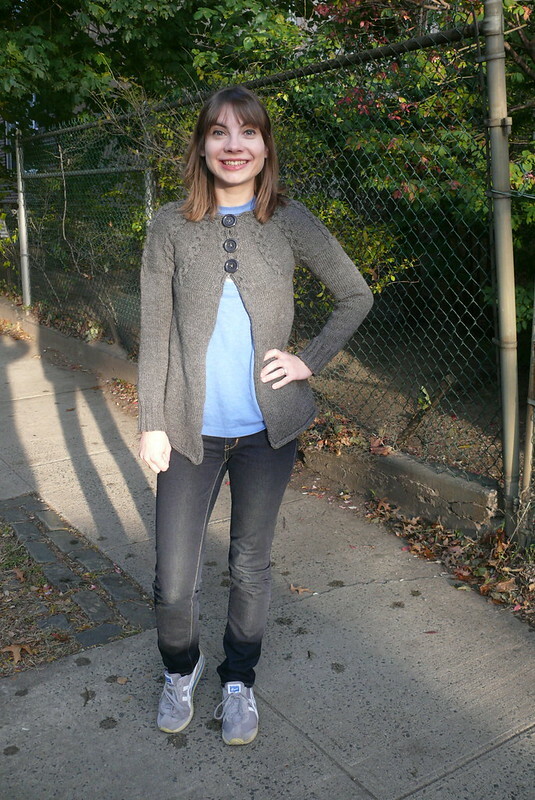 Esther used a knit and some stretch lace- how pretty is this?! Look at Kim‘s faux suede! Awesome! What about a classic black version, like Emmie‘s? Look at this version, from The Pretty Pickle! Christy made a sporty version out of sparkly ponte. Fun! This version from The New Craft Society, in quilted Liberty lawn, is fantastic! Whaddaya think? Inspired yet??? I sure hope so! OK, just as a reminder, we’ll be sewing together throughout the month of January. You can add your photos to our Flickr group, and our hashtag for Instagram or Twitter is #rigelbomberjanuary. You can grab a copy of the pattern here if you haven’t already. Alright… now… ready, set, Rigel!